Preheat oven to 350°. Unroll dough into a rectangle on a greased baking sheet. 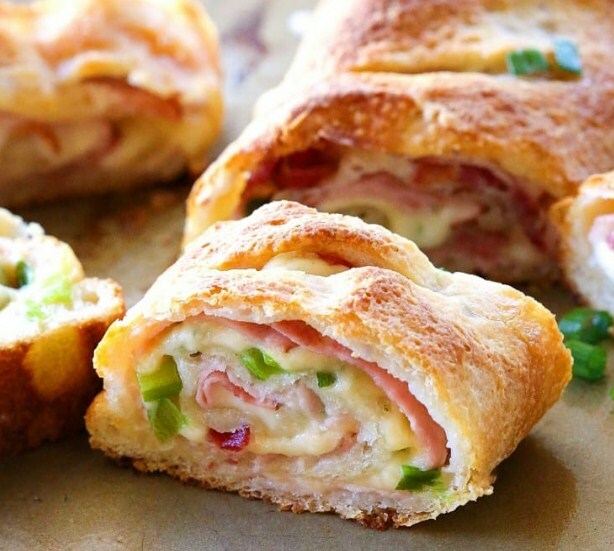 Place ham over dough to within 1/2 inches of edges of the dough; sprinkle evenly with onions, bacon and cheese. Roll up jelly-roll style, starting with a long side. Pinch seam to seal and tuck ends under. Place seam side down on baking sheet. With a sharp knife, cut several 1/4-in.-deep slits on top of loaf. Bake 20-30 minutes or until golden brown. Cool slightly before slicing. Serve warm. You can also use sliced swiss cheese. It makes it a littler harder to roll but works just as well! Source: slightly adapted from Taste of Home. I used less green onions.